I have always read a fairly wide variety of manga and anime, including types and genres even I find questionable (damnit, Franken Fran gave me nightmares). I think the first title I ever watched was Vampire Hunter D, way back in the late 80s and since that time, I bounced back and forth between more psychologically challenging work and comedy anime (I watched so much Paniponi Dash). But I remember first reading translated scans of Nana and was quickly taken with that series and then wanting to know more about work geared towards adult women. Josei manga and anime have a poignancy that often evokes a faint sense of nostalgia that might be more related to past emotions than past experiences. Maybe it's because it's actually geared towards my gender/age group and can seem instantly identifiable on some level. Maybe because it has characters struggling with complex relationships, always being a bit bittersweet and like with life, involving ambiguous loss. You know, how any type of growth involves giving things up, including relationships and how that is unavoidable and pervasive. Even stagnation requires change and never truly insulates us from the pain of transition. I feel like josei manga captures that acutely, maybe even being at its core since that is one of the essential struggles of adulthood. Regardless of the reasons, I wish Josei manga were more widely translated and available in the US. In fact when I was thinking of writing this post, I read several different articles about Josei anime, much of it wishing that more was available rather than offering suggestions. In that spirit of wanting to read more about josei manga, I will talk about a few of my favorites—ones that are likely widely known in the United States, with the hope of hearing about other people's favorites and perhaps titles that are unknown to me. Ai Yazawa's work, especially Nana, Paradise Kiss and Neighborhood Story: Ai Yazawa has not been producing much for several years, after taking a break for an undisclosed illness. She has produced a few sketches but basically stopped producing Nana mid-cliffhanger, so Nana as a manga/anime is a bit of a heartbreaker, being forever unfinished. 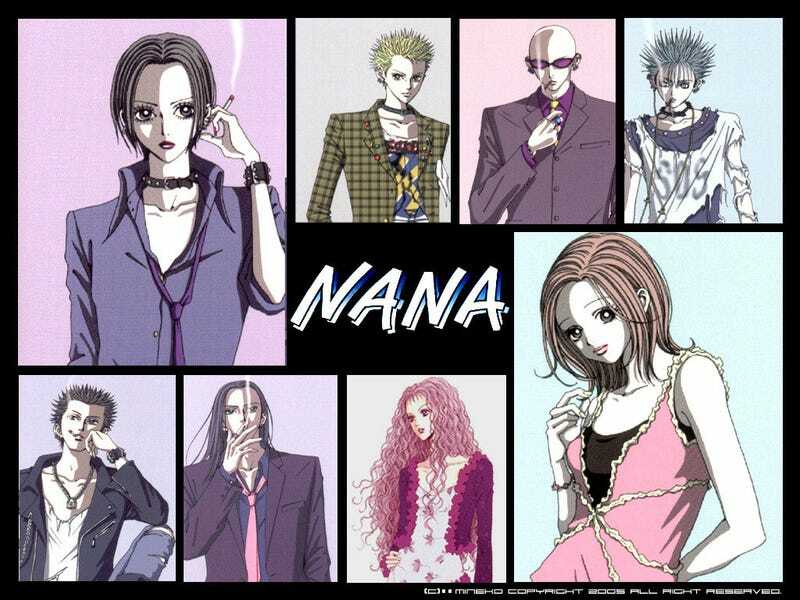 With that said, I really fell in love with Nana at first site, given its obvious love of English Punk and fashion, Ai Yazawa herself was trying to speak for herself and to all sorts of women who felt caught being frustrated with social convention and desiring an idealized romance. Both Nana's start out being overly rigid in their representations but their characters develop and blend. I wished the story will continue. I won't give spoilers but the fate of Nana O. felt undone and sad and Nana K's compromises felt too unexplained. Paradise Kiss had some similar themes, as a young woman dealing with being a fish out of water while entering the world of artist, this time in fashion rather than music. The characters felt ambiguous, especially George, as he was quite the antihero, rather than the conventional love interest. The fate of Yukari didn't follow an easy or expected path. But mostly I really loved the art and the fashion. Yazawa's work is really divine and she really does have an eye for style. Princess Jellyfish: I actually find the main plot involving Kuranosuke and Tsukimi the least interesting part of this show. It's like Orange is the New Black, where the side stories of the supporting characters is far more interesting than the plot of the young woman being taken by a mysterious beauty who must keep his gender secret in a household where all the women want to hide away from men. I want to know more about the flawed and weird women of this household, who are an exaggerated and overly serious version of many women I know. No, we don't hate men, but we do sometimes get frustrated at patriarchal BS. And there is something satisfying about seeing women being singularly focused on very specific interests, like trains or Chinese historical text and not dealing well with any intrusion from conventional society. There is something eminently satisfying about a woman (Akiko Higashimura), writing about female geekiness that doesn't give it short shrift. Their lives seemed far more aspirational than it may seem at first glance. Overall, pretty satisfying, even with the romance and some questionable representations of women (when depicting the rivals). And I liked the fashion. Always the fashion. Chihayafuru: Chihaya, the protagonist, struggles with the loss and longing of a treasured childhood friend who moved far away and so she begins a karuta club to be closer to him. Karuta becomes emblematic of their childhood bond and deep desire to recapture those feelings or perhaps even to defend against loss. In the process of forming this club, she begins to develop a complicated relationship with her co-founder, where his unrequited emotional feelings might represent the present. Caught in this tension, Chihaya remains ambivalent, maybe conflicted but also focused on her passion for the poetry of competitive karuta. It's a sweet manga (and anime) that uses these relationships against a backdrop of competitive karuta and Chihaya's not insignificant desires to become the queen of the game. The game itself is really fascinating to see depicted on-screen as well, which I can't describe well but involves the quick recall of dozens of poems. I haven't seen this series for a while but it is all on crunchyroll, so I may have to peruse it again. Yuki Suetsugu, the artist, draws a beautiful and sensitive story that despite taking place in high school, is decidedly geared towards adult women, both because of its style and storytelling and its publication in a magazine geared towards adult women. So this was my short, not at all exhaustive discussion of josei manga and anime. Do you have any thoughts or suggestions? I would love to hear more about other series.